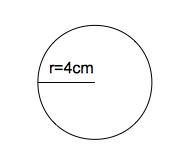 The radius of a circle is 4 cm, what is the area? The area of a circle is found by: , where r is the radius. The area of the circle is . The radius, , of the circle below is 18 units. What is the area of the circle? You could do the arithmetic to get an area of about 1,017.876 square units, but it is ok and more precise to leave it as shown. Give the area of a circle with diameter 13. Point A is the center of the circle above. Figure ABCD is a square. Segments AB and AD are radii of the circle. The radius of the circle is units. Find the area of the red-colored shape. Since it is stated that A is the center of the circle and ABCD is a square, angle BAD is a right angle that comprises exactly one fourth of the circle (90o is one fourth of 360o). This can also be seen through a proportion. 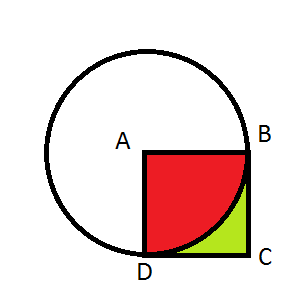 Since the angle that contains the red area is one fourth of the circle, finding the area of the entire circle, and then one fourth of that number gives the answer. Use the equation to find the area of a circle, where is area and is the radius. Find the area of the ice rink formed by the rectangle and semi-circles with the dimensions shown. To find the area of the entire rink, find the area of the rectangle in the middle of the rink and add it to the area of the circle that would be formed by the two semi-crcles on the edges of that rectangle. The area of the rectangle is found by multiplying its width by its length. To find the area of the circle that accounts for the two semi-circles, use the formula , where is the radius of the circle. The radius of the circle is half of its diameter. The diameter of the circle is the same as the width of the rectangle in the case of this rink, and half of that is . Adding this area to the area of the rectangle gives the area of the entire rink. If a circle has circumference 8π, what is its area? If the circumference is 8π, then since C=2πr we know r=4. We further know that A=πr2, so A=π(4)2=16π. If the equation of a circle is (x – 7)2 + (y + 1)2 = 81, what is the area of the circle? The area of a circle is πr2, so the area of this circle is 81π. A man would like to put a circular whirlpool in his backyard. He would like the whirlpool to be six feet wide. His backyard is 8 feet long by 7 feet wide. By state regulation, in order to put a whirlpool in a backyard space, the space must be 1.5 times bigger than the pool. Can the man legally install the whirlpool? No, because the area of the backyard is 30 square feet and therefore the whirlpool is too big to meet the legal requirement. Yes, because the area of the whirlpool is 28.26 square feet and 1.5 times its area would be less than the area of the backyard. No, because the area of the backyard is smaller than the area of the whirlpool. Yes, because the area of the whirlpool is 18.84 square feet and 1.5 times its area would be less than the area of the backyard. No, because the area of the whirlpool is 42.39 square feet and 1.5 times its area would be greater than the area of the backyard. If you answered that the whirlpool’s area is 18.84 feet and therefore fits, you are incorrect because 18.84 is the circumference of the whirlpool, not the area. If you answered that the area of the whirlpool is 56.52 feet, you multiplied the area of the whirlpool by 1.5 and assumed that that was the correct area, not the legal limit. If you answered that the area of the backyard was smaller than the area of the whirlpool, you did not calculate area correctly. And if you thought the area of the backyard was 30 feet, you found the perimeter of the backyard, not the area. The correct answer is that the area of the whirlpool is 28.26 feet and, when multiplied by 1.5 = 42.39, which is smaller than the area of the backyard, which is 56 square feet. There are two identical circles on a plane that overlap. The radius of both circles is 1. The region in which they overlap has an area of π. What is the total area of the 2 overlapping circles? Since the region overlaps, we cannot count it twice, so we must subtract it. 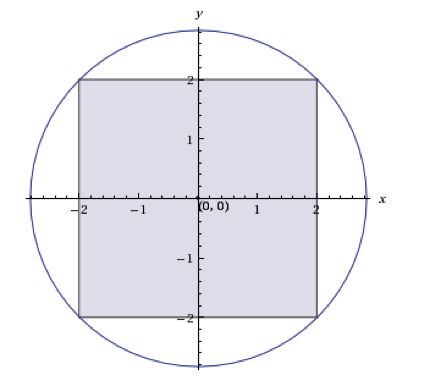 A square with a side length of 4 inches is inscribed in a circle, as shown below. What is the area of the unshaded region inside of the circle, in square inches? 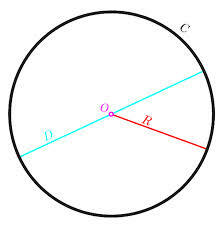 Using the Pythagorean Theorem, the diameter of the circle (also the diagonal of the square) can be found to be 4√2. Thus, the radius of the circle is half of the diameter, or 2√2. The area of the circle is then π(2√2)2, which equals 8π. Next, the area of the square must be subtracted from the entire circle, yielding an area of 8π-16 square inches. Hacettepe, Bachelor of Science, Economics. Claremont Graduate University, Master of Economics, Economics.